I'm Brianne, and my life is a traveling life! 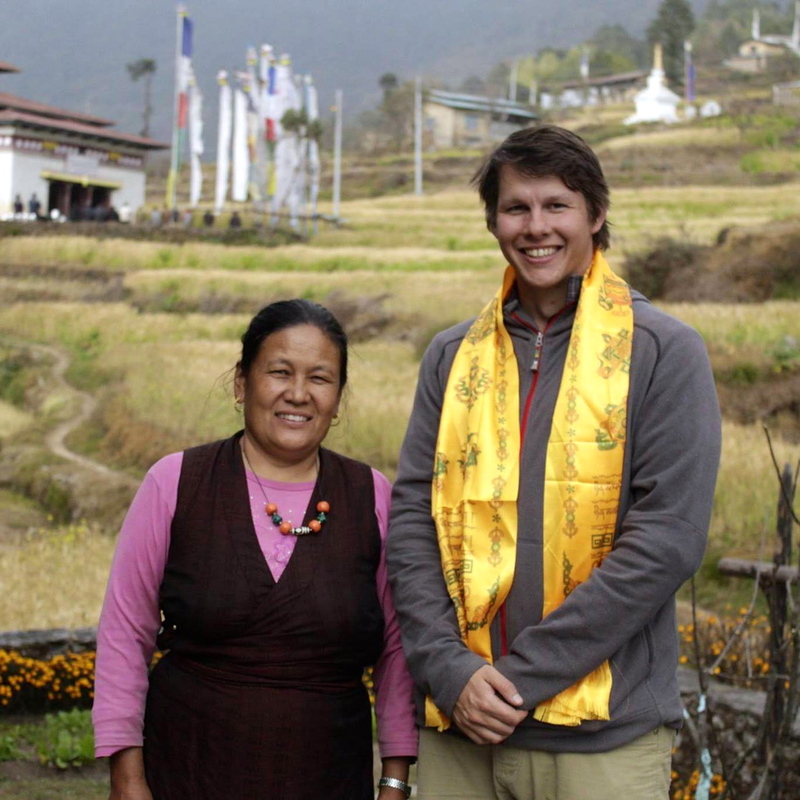 This is Beau with Dolma Lama, who was killed with her family in the initial shock of the earthquake. This was taken in Gangyul, just this past December. Beau Miller is executive director of the Washington, D.C.-based NGO Aythos, which was the first relief organizations to reach some of the devastated villages of the Sindhupalchok District. He arrived in Nepal on April 30, and took time to email with me this week. 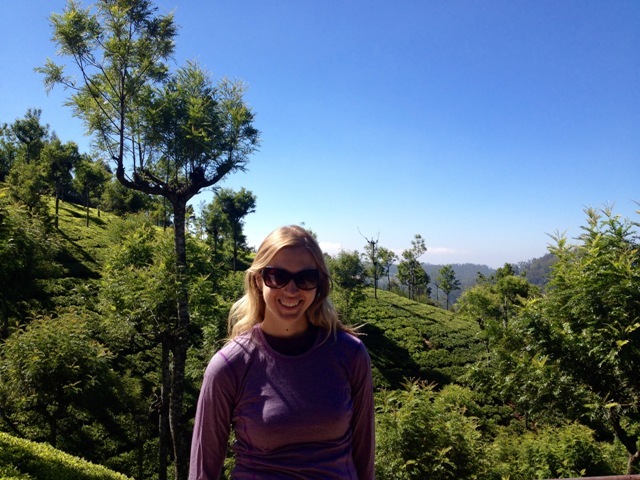 What prompted your first trip to Nepal? I first went to Nepal in 2008 to teach English for five months. Prior to that, I was a brewer in Colorado, and I left to try to understand a little bit more of the world. This is now my seventh trip. Nepal is the kind of place that never leaves you, even if you don’t understand why that is. It’s just a very special place, despite a lot of the issues it has. It’s the kind of place I find my thoughts drifting back to, and whenever I see a photo or hear somebody talk about it, I immediately have the urge to go back. Why did you start Aythos? I started Aythos in 2009 after I returned from Nepal. 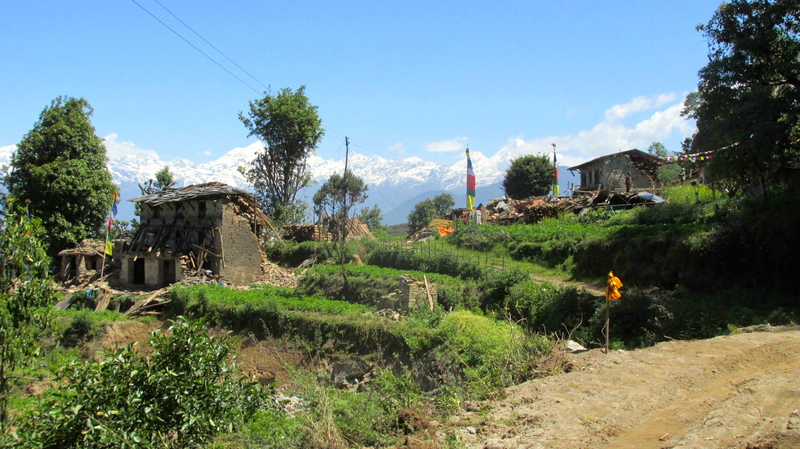 I had visited a remote village in a Himalayan area called Helambu, and I was hooked. The people were beyond hospitable, with an amazing sense of humor, and even though only a few of them spoke any English, they always made me feel welcome and wanted to know more about me. As I learned more about them and their culture, I understood they faced some real challenges, and so I started Aythos with some good friends of mine to help them with local education and agriculture development initiatives. 100 villagers of Okreni lost their homes. Here they are waiting for help. Why have you remained committed to this work? Honestly, I don’t know what else I would do. I don’t know if I could ever stop working in Nepal. It’s great to see projects being implemented, and I love meeting new people there and hearing about their lives. But, in a way, I’m never satisfied. Whatever good happens there because of Aythos, there is always more to be done, and I’m happy to work with a wonderful team to do it. Here is Beau with his Aythos colleague David, and an Aythos volunteer, Sonam, coordinating relief efforts with the Rinpoche of the White Monastery. What are Aythos’ priorities for the relief efforts? We were the first relief team to reach these rural areas. My colleague Dave has been putting his EMT experience to work, supporting a team of Buddhist monks and international medical workers from the White Monastery. They are in Helambu treating injuries of as-yet-untreated earthquake victims – they are seeing a lot of infections. I’m with a local crew in Okreni village distributing shelter materials, food and medical supplies for 70 people. I will also be assessing surrounding villages to determine future ways to support them. We had heard of looters but all we’ve seen is pleas for help while standing in front of our vehicle and sobs of joy when we can offer a tarp to protect their families from the daily rains. 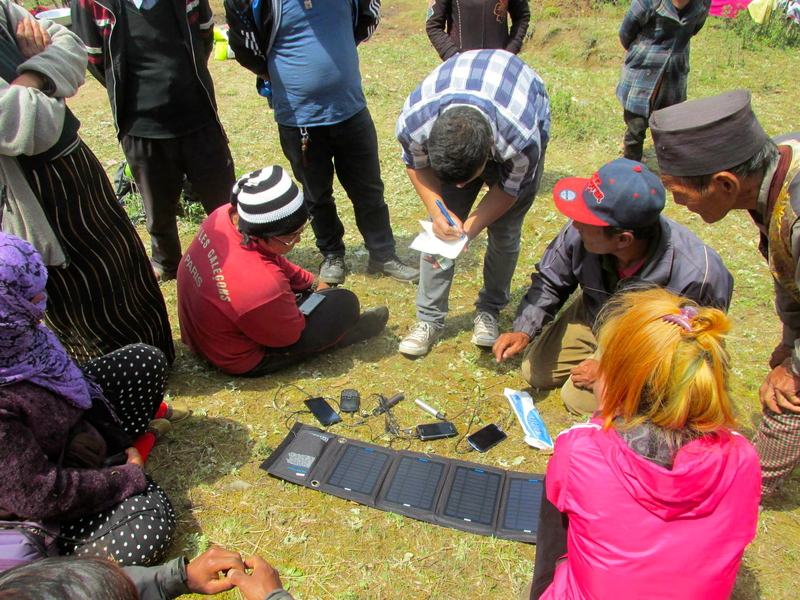 Aythos provided several forms of chargers for mobile phone batteries, including this set of solar panels, so villagers could charge their phones to contact loved ones. Right now, I’m on autopilot. The villages I know have been destroyed – in Helambu alone, about 200 people have been killed and 300 more are without shelter. So I’ve lost a lot of friends – people who have hosted me, fed me, laughed with me. These places I know and love will never be the same, but I know that through Aythos, we have a real opportunity to help people that would not get help otherwise. I’ve been in disaster responses before, and these relief workers need to know where to go. That’s where I think that Aythos can be a big help. To support Beau and his team, you can donate to the Aythos Earthquake Relief Fund. You also can follow their work on Facebook and Twitter. 140 pounds of tarps, feminine hygiene products, shoes, and gloves were donated by several individuals and the Center for Independence of the Disabled New York. Loading up supplies. 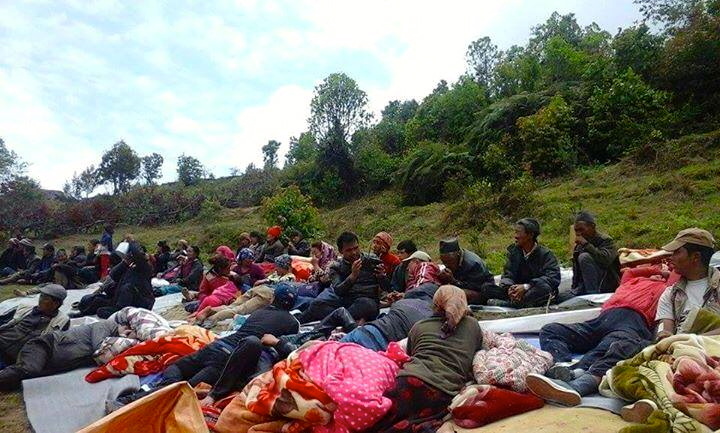 Aythos was the first relief organization into Okreni and this area of Sindhupalchok. Aythos and Karma Rinzig teamed up to donate food and shelter materials to several villages in the area. Together, they filled two jeeps! Aythos was warmly welcomed in Okreni by families who had faced numerous hardships and lived in fear of more aftershocks since the earthquake hit a week before. Aythos provided tarps to villagers in Okreni, who had taken shelter in a greenhouse since the earthquake hit. Children are some of the most affected by the earthquake. The shock of the quake and losing loved ones compounds issues already stemming from living in poverty. Four people in this house, including an infant girl, were killed in the initial shock.Villagers said that their bodies were found together, still embracing each other. Sonam treated the injured from the earthquake. While most villagers survived with only some bumps and bruises, others in Okreni were not so lucky. Four family members were killed in the initial shock. Awesome post. Thanks for sharing this with us! My goal is to provide you with advice & inspiration so that you can live a traveling life too!